Spring has arrived! This means it’s now time to put away your coats and dark-colored outfits and, instead, bring out those bright printed ensembles. If you’re looking for some style inspiration on how to work those prints, Emma Roberts recently rocked one that you might like! The 23-year-old American Horror Story star looked effortlessly chic on a Monday afternoon while out and about in West Hollywood. She was spotted wearing navy-blue-and-white polka-dotted trousers paired with a form-fitted white top and white Isabel Marant sneakers. Emma Roberts definitely looked very comfy in her casual outfit. 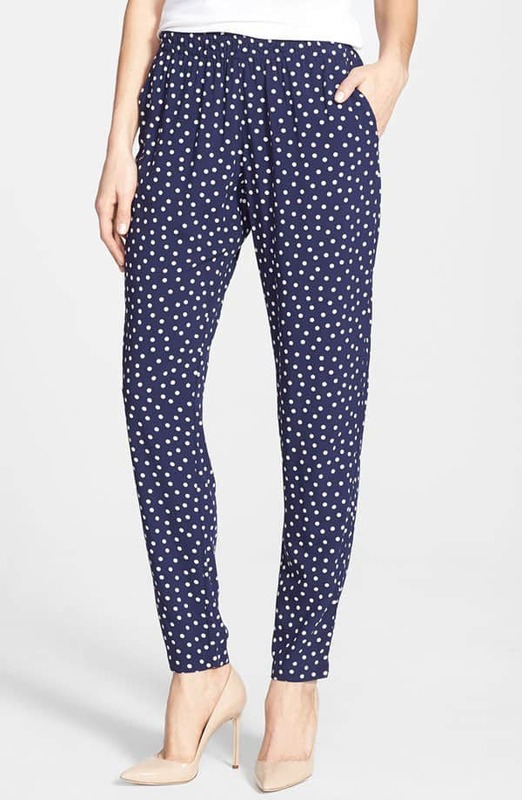 Her pants by Three Dots are made of viscose rayon and feature an elastic waist, pleats, and tapered ends. These are now on sale! Would you wear these pants the way Emma Roberts did?